IRS tax relief help is something thousands of Americans seek every year. From back taxes to tax evasion, individuals looking for tax relief may be frustrated with the process and have a difficult time staying on top of all the correspondence and work needed to remedy tax problems. The most important thing an individual may do to find relief is to engage the services of a tax resolution firm that employs accredited IRS enrolled agents, tax attorneys, certified tax specialists, and other financial experts. While it is possible for an individual to find tax relief on his or her own, the chances of securing the optimal resolution without professional guidance are greatly reduced. Tax resolution experts can help you secure the documentation necessary to prove your circumstances to the IRS and bring your filing status up to date. They can also speak to the IRS on your behalf and help you work out a settlement plan that is customized for your situation rather than trying to make your circumstances fit into one preplanned solution. Here are some tax relief strategies that effectively reduce tax liabilities. Have a professional review your tax history – It is possible that a tax return is erroneous or that the amount that the IRS is holding you liable for is wrong. A tax expert can review your history, including all previously filed documents to determine if there are discrepancies between what you are being billed for and what you actually owe. Installment agreements – Under this plan, the IRS will grant you a period of time during which you will be expected to pay a certain amount per month. The installment amount that you will pay on a regular basis will be equal to your debt divided by 30. You may pay more than the minimum per month to pay off the debt, but you must pay off the debt during the predetermined period of time. You can only have one installment agreement open with the IRS at a time, and you must have a good record for tax filing to qualify for an installment agreement. Offers in compromise – These agreements provide taxpayers with a lower settlement than the total amount of debt that is owed. The IRS will look at your whole financial situation including income, expenses, and assets to determine if the arrangement will be a viable option for both the IRS and for you. You will be found ineligible for this arrangement if you are not current with your tax return filing or if you are currently filing for bankruptcy. You may pay off the remaining balance in a few short payments or over an installment plan. Partial payment installment agreement – This debt relief is a cross between an installment agreement and an offer in compromise. You will be required to pay off the debt at a predetermined rate as you would in an installment agreement. At the end of that agreement, assuming you have paid the full amount on time, the rest of your debts will be forgiven. Tax appeal – If an appeal is an approach that you can consider in your circumstances, you will likely be mailed a notice from the IRS about your right to appeal. You can appeal offers in compromise, liens, installment plans, and innocent spouse relief among other decisions with which you disagree. Not currently collectible – If you can demonstrate financial hardship, your debt may be suspended for a period of time. This provision unfortunately won’t remove your debts, but they will give you enough time to find a way to pay. Filing bankruptcy – This decision should never be made solely on your tax debts, but if you are going to file for bankruptcy anyway, you may be able to get some or all of your tax debts discharged. The laws regarding bankruptcy and tax debt discharge are very complex and you will likely need the assistance of a tax resolution expert and a bankruptcy attorney to determine the outcome of your tax discharge with this method. Ultimately, there is no magical secret that will help you erase your tax debt. For most individuals, the process requires hard work and a number of strategies put together by a tax resolution service. The solution that is right for you will depend largely on the amount of debt you owe and your financial circumstances. 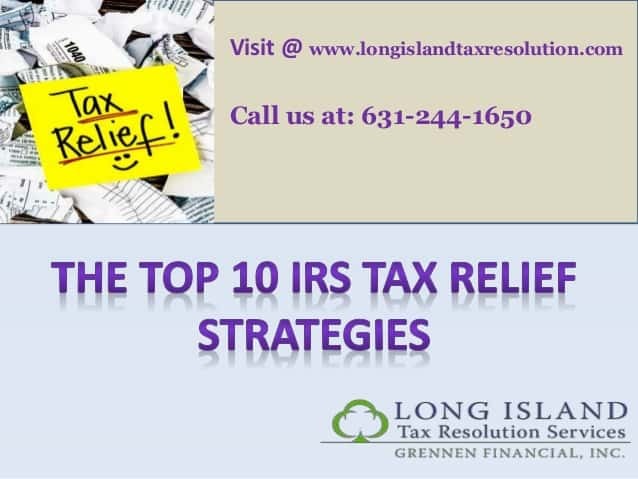 Long Island Tax Resolution Services offers personalized IRS tax relief help developed by a team of tax experts for your unique situation.